Long distance plane trips provide a good opportunity to catch up with some of the latest films uninterrupted. I managed to pack in five on my flights to and from Vancouver for the Third World Symposium on the Prevention of Assisted Suicide and Euthanasia. Two of these were the sort of thing that is tempting to watch when one is near brain dead from jet lag – Liam Neeson’s latest action drama Unknown, in which a man awakes from a coma to find that his wife apparently does not recognise him and the outlandish secret agent spoof Knight and Day featuring Tom Cruise and Cameron Diaz. But I also saw three other films, all of which touch on the current euthanasia debate, that were more than mildly thought-provoking. Never Let me go, featuring Keira Knightly, tells the story of three children, Ruth, Kathy and Tommy, who spend their childhood at a seemingly idyllic English boarding school. However as they grow into young adults, they find that they have to come to terms with a haunting reality - that they have actually been prepared, both physically and through social conditioning, to be organ donors. The film captures the existential angst of young people coming to terms with the awful reality that their sole purpose is simply to give life to others. The most chilling aspect of the film is the way in which they accept the inevitability of their fate apparently making no attempt to escape even as their inevitable ‘completions’ approach. They have been far too skilfully manipulated already to have any chance of breaking free. It brings new meaning to the legal concepts of ‘duress’ and ‘undue influence’. 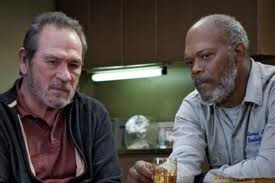 The Sunset Limited (scene above), essentially a ninety minute dialogue featuring Tommy Lee Jones playing a professor who has just tried to commit suicide by throwing himself in front of a train, plumbs the depths of existential despair. Jones character is a hardened and bitter atheist who has chosen to follow through with the logical, consequences of his nihilistic world view. His rescuer is a black man, played by Samuel L Jackson, who is a committed Christian and tries to convince him not to take his own life. The ending is not what you might expect, but Tommy Lee Jones, who is also the director, provides a lot of insight into the mindset of those who seek so-called ‘rational suicide’. Goethe, is a study of the early life of the celebrated German poet of the same name. It retells the story of the quasi-autobiographical love story ‘The Sorrows of Young Werther’ which made Goethe famous. The book, when initially published in 1774, provoked a spate of suicides amongst young people, and thereby gave rise to the medical term ‘Werther Effect’ meaning ‘copycat suicide’ or ‘suicide contagion’. All three films explore themes that are hugely relevant today. They are not films to ‘enjoy’, but if you want something to provoke good discussion or reflection then they are well worth a view. I won’t spoil the plots for you more than I have done already – but these three films certainly got me thinking more about the dangers of legalising assisted suicide in order to provide a medical solution for what is actually at heart an existential problem. Nice site!!! But this information wasn’t helpful. I expected more details. I may visit another time for updates. Keep up the effort!